Some people click pens, others twirl their hair, some play with their shirt buttons and some roll pencils on a desk. Whether we realize it or not, most of us fidget in some way. The problem is that fidgeting can be distracting and in some cases self-harming. However, there is a solution – Squidget! The Squidget is a palm-sized cubical device, designed specifically to redirect this fidgeting energy safely and more productively. With our team of fidgeters, educators and engineers, we have designed the Squidget as a tool for fidgeters of all ages. With multiple options and surfaces, Squidget allows you to fidget YOUR way. It’s safe, satisfying and helps most individuals become more productive. The original Squidget features seven options that replicate the most common fidgeting habits in a safe and non-disruptive manner. It was designed to enable discreet, almost noiseless fidgeting, while providing the widest assortment of functionality to satisfy the mot frequent fidgeting behaviors. Like the original Squidget, the "S.O.A.P." - Squidget-On-A-Pen features alternatives to the most common fidgeting habits. But the SOAP can be attached to the top of a pen for easy carrying! It can also be removed at any time and placed on a new pen as needed. WHAT MAKES IT UNIQUE AND EFFECTIVE? Parents, Kids and Everyday Folks! 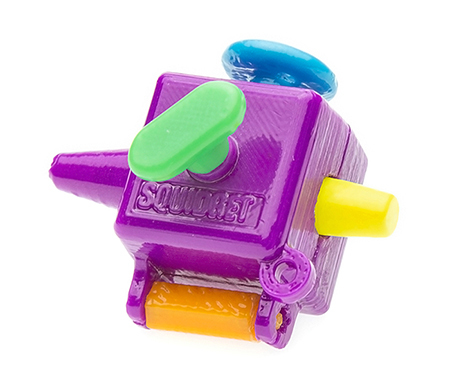 Squidgeters can enjoy all of the tactile satisfaction of pressing a pen-top repeatedly without making the annoying clicking noise. Your classmates will thank you. Squidgeters will experience the satisfying vibration needed to help them focus, without the sound of a pencil echoing on a desktop. Squidgeters can flick or spin this tab on the cube to help calm, center, and focus in distracting situations. A safe and satisfying alternative for those who twirl their hair, preventing hair loss, possible infection and bad hair days. You can rub your fingers over this satisfying, curved interrupted surface without the risk of creating callouses or infection (not available on the SOAP). Squidgeters can now twirl a button without ruining any of their shirts. Users can dig their nails into the two deep grooves on the periphery of the surface as a safe alternative to more harmful fidgeting. Take advantage of our 'B2G3' Holiday Promotion and Order 2 TODAY! See how Squidget can help you calm, regain focus, unleash your creativity and more!